Fosfor (P), birçok fizyolojik ve biyokimyasal süreçte önemli bir element olduğu için bilinen tüm canlılar için mutlak gereklidir. Toprak oluşum süreçlerine ve arazi kullanımına bağlı olarak ortaya çıkFosfor (P), birçok fizyolojik ve biyokimyasal süreçte önemli bir element olduğu için bilinen tüm canlılar için mutlak gereklidir. Toprak oluşum süreçlerine ve arazi kullanımına bağlı olarak ortaya çıkan toprak özellikleri topraklarda fosforunun yarayışlılığı ve jeokimyasal fraksiyonlarında değişikliklere neden olmaktadır. Bu çalışmada Atabey Ovası’ndan toplam 71 adet yüzey toprak örneği (0-20 cm) alınmıştır. Topraklarda kademeli fosfor fraksiyonlaması yapılmıştır. Bu fraksiyonlar; sodyum bikarbonat [NaHCO3-P (organik Po, inorganik Pi ve total Pt)], sodyum hidroksit [NaOH-P (organik Po, inorganik Pi ve total Pt)], sitrat bikarbonat dithionit (CBD-P), hidroklorik asit ile ekstrakte edilebilen (Ca-P) ve bakiye (Res-P) fosfor şeklindedir. Fosfor fraksiyonlarının toprak özellikleri ile olan ilişkileri tanımlayıcı istatistik analizleri, Pearson korelasyon analizi ve kemometrik analizlerle ortaya konulmaya çalışmıştır. Ova topraklarında fraksiyonların ortalama dağılım sırası büyükten küçüğe doğru Ca-P (% 50.36) > Res-P (% 19.94) > CBD-P (% 12.17) > NaOH-Pt(% 6.94) > NaOH-Pi(% 6.24) > NaHCO3-Pt (% 1.82) > NaHCO3-Pi(% 1.57) > NaOH-Po (% 0.71) > NaHCO3-Po (% 0.25) şeklinde izlenmiştir. Bu fraksiyonların oransal dağılımının arazi kullanım şekline bağlı gübreleme miktarına göre değiştiği belirlenmiştir. Phosphorus (P) is essential to all known life forms because it is a key element in many physiological and biochemical processes. Soil properties due to soil formation processes and land use have impacts on the availability of phosphorus in soils and on the change in geochemical fractions. Thus, total of 71 surface soil samples (0-20 cm) were taken from the Atabey Plain. The sequential extraction procedure was executed in the samples. The determined fractions were: sodium bicarbonate [NaHCO3-P (organic Po, inorganic Pi and Total Pt)], sodium hydroxide [NaOH-P (organic Po, inorganic Pi and Total Pt)], citrate bicarbonate dithionite (CBD-P), hydrochloric acid (Ca-P), and residual (Res-P) phosphorus. Relations of phosphorus fractions with soil properties were revealed by descriptive statistics, Pearson correlation analysis and chemometric analysis. The average distribution of fractions in the plain soils in descending order were: Ca-P (% 50.36) > Res-P (% 19.94) > CBD-P (% 12.17) > NaOH-Pi(% 6.24) > NaHCO3-Pi(% 1.57) > NaOH-Po (% 0.71) > NaHCO3-Po (% 0.25). It was determined that the fractal distribution of these fractions changed according to the land use pattern-dependent on fertilizer usage. Achat, D.L., Pousse, N., Nicolas, M., Brédoire, F., Augusto, L., 2016. Soil properties controlling inorganic phosphorus availability: general results from a national forest network and a global compilation of the literature. Biogeochemistry, 127(2): 255-272. Doi: 10.1007/s10533-015-0178-0. Akinremi, O.O., Cho, C.M., 1991. Phosphate and accompanying cation transport in a calcareous cation-exchange resin system. Soil Science Society of America Journal, 55(4): 959-964. Doi.10.2136/sssaj1991.03615995005500040010x. Akgül, M., Başayiğit, L., Uçar, Y., Müjdeci, M., 2001. Atabey Ovası toprakları. Süleyman Demirel Üniversitesi Yayınları, 71s, Isparta. Alovisi, A.M.T., Neto, A.E.F., Serra, A.P., Alovisi, A.A., Tokura, L.K., Lourente, E.R.P., da Silva, R.S., da Silva, C.F.B., Fernandes, J.S., 2016. Phosphorus and silicon fertilizer rates effects on dynamics of soil phosphorus fractions in oxisol under common bean cultivation. African Journal of Agricultural Research, 11(30): 2697-2707. Doi.10.5897/ajar2016.11304. Berkman, E. T., Reise, S. P., 2012. A conceptual guide to statistics using SPSS. Sage ISO 690. Dieter, D., Elsenbeer, H., Turner, B.L., 2010. Phosphorus fractionation in lowland tropical rainforest soils in Central Panama. Catena, 82(2): 118-125. Doi.org/10.1016/j.catena.2010.05.010. Durgun, B., 2016. Atabey Ovasındaki toprak serilerinde çinko fraksiyonlarının belirlenmesi. Süleyman Demirel Üniversitesi, Fen Bilimleri Enstitüsü, Yüksek Lisans Tezi, 92s, Isparta. Drouineau, G., 1942. Dosage rapide du calcaire actif de sols. Nouvelles donnes sur la repatition et la nature des fractions calcaires. Annales de Agronomie, 12: 441-450. Gee, G.W., and J.W. Bauder. 1986. Particle-size analysis. In: Klute A. (ed.). Methods of soil analysis. Part 1. 2nd ed. Agron. Monogr. 9. ASA and SSSA, Madison, WI., USA. pp. 383-411. Halajnia, A., Haghnia, G.H., Fotovat, A., Khorasani, R., 2009. Phosphorus fractions in calcareous soils amended with p fertilizer and cattle manure. Geoderma, 150(1): 209-213. Doi.org/10.1016/j.geoderma.2009.02.010. He, Z. L., Yang, X., Yuan, K. N., Zhu, Z. X., 1994. Desorption and plant-availability of phosphate sorbed by some important minerals. Plant Soil, 162 (1): 89–97. Karaman, M.R., 2012. Bitki besleme. Gaziosmanpaşa Üniversitesi Ziraat Fakültesi Yayınları, Yayın No: 14021, 1066s, Ankara. Kacar, B., Katkat, A.V., 2009. Bitki Besleme. Ankara Üniversitesi Ziraat Fakültesi Yayınları, Yayın No: 849, 659s, Ankara. Kacar, B., 2013. Temel Gübre Bilgisi. Ankara Üniversitesi Ziraat Fakültesi Yayınları, Yayın No: 695, 502s, Ankara. Korkmaz, K., 2005. Kireçli toprakların fosfor durumlarının belirlenmesi ve fosfor uygulamasının mısır verimine etkisi. Çukurova Üniversitesi, Fen Bilimleri Enstitüsü, Doktora Tezi, 136s, Adana. Kuo, S. 1996. Phosphorus. In: Sparks, DL(ed.). Methods of Soil Analysis Part 3, Chemical methods. Soil Science Society of America, Series No: 5, WI, USA. pp. 869-920. Lindsay, W.L., 1979. Chemical equilibria in soils. John Wiley and Sons, New York, USA. Lindsay, W.L., 2001. Chemical equilibria in soils. The Blackburn Press, USA. Lyons, J.B., Gorres, J.H., Amador J.A., 1998. Spatial and temporal variability of phosphorus retention in a riparian forest soil. Journal of Environmental Quality, 27: 895-903. Doi:10.2134/jeq1998.00472425002700040025x. Maranguit, D., Guillaume, T., Kuzyakov, Y., 2017. Land-use change affects phosphorus fractions in highly weathered tropical soils. Catena, 149: 385-393. Doi.org/10.1016/j.catena.2016.10.010. Nelson, D.W., Sommers, L.E., 1982. Total Carbon, Organic Carbon and Organic Matter. In: Page, A.L. et al (Eds). Methods of soil analysis, Part 2. Chemical and microbiological properties. 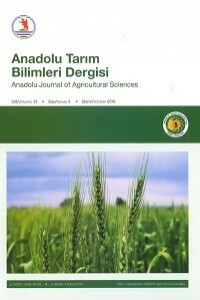 Second Edition, Soil Science Society of America, Agronomy No: 9, WI, USA. pp. 539-579.Olsen, S.R., Cole, C.V., Watanabe F.S., Dean. L.A., 1954. Estimation of available phosphorus in soils by extraction with sodium bicarbonate. US. Department of Agriculture, Circ. 939. Patiram, R.N., Raj, M.M., Prasad, R.N., 1990. Forms of soil phosphorus and suitable extactants for available phosphorus in acid soils of Sikkim. Journal of Indian Society of Soil Science, 38(1): 237-242. Rhoades, J.D., 1982. Cation Exchange Capacity. In: Page, A.L. et al (Eds). Methods of soil analysis, Part 2. Chemical and microbiological properties. Second Edition, Soil Science Society of America, Agronomy No: 9, WI, USA. pp. 149-147. Saltali, K., Kιlιç, K., Koçyigit, R., 2007. Changes in sequentially extracted phosphorus fractions in adjacent arable and grassland ecosystems. Arid Land Research and Management, 21(1): 81-89. Doi.org/10.1080/15324980601074602. SPSS, I., 2004. SPSS 13.0 for Windows. Chicago, Illinois, USA. Solis, P., Torrent, J., 1989. Phosphate fractions in calcareous Vertisols and Inceptisols of Spain. Soil Science Society of America Journal, 53: 462-466. Doi.10.2136/sssaj1989.03615995005300020026x. Tandon, H.L.S., 1987. Phosphorous research and agricultural production in India. Fertility Development and Consultant Organization, Food and Agriculture Organization of the United Nations, Greater Kailash 1, New Delhi. Uygur, V., Karabatak, I., 2009. The effect of organic amendments on mineral phosphate fractions in calcareous soils. Journal of Plant Nutrition and Soil Science, 172(3): 336-345. Doi.10.1002/jpln.200700326. Uygur, V., Durgun, B., Şenol, H., 2017. Chemical fractions of phosphorus: the effect of soil orders, soil properties, and land use. Communications in Soil Science and Plant Analysis, 48: 1319-1335. Doi.org/10.1080/00103624.2017.1341919. Violante, A., Pigna, M., Ricciardella, M., Gianfreda, L., 2002. Adsorption of phosphate on variable charge minerals and soils as affected by organic and inorganic ligands. Development in Soil Science, 28A: 279-295. Walker, T., Syers. J., 1976. The fate of phosphorus during pedogenesis. Geoderma, 15: 1–19. Doi.org/10.1016/S0166-2481(02)80057-5. Weaver, R. M. 1974. A simplified determination of reductant-soluble phosphate in soil phosphate fractionation schemes. Soil Science Society of American Proceedings, 38: 153–54. Doi:10.2136/sssaj1974.03615995003800010048x. Wei, S., Tan, W., Liu, F., Zhao, W., Weng. L., 2014. Surface properties and phosphate adsorption of binary systems containing goethite and kaolinite. Geoderma, 213: 478–484. Doi.org/10.1016/j.geoderma.2013.09.001. Yi-Chao, S.H.I., Ziadi, N., Messiga, A.J., Lalande, R., Zheng-Yi, H.U., 2015. Soil phosphorus fractions change in winter in a corn-soybean rotation with tillage and phosphorus fertilization. Soil Science Society of China, 25(1): 1-11. Doi.org/10.1016/S1002-0160(14)60071-0.